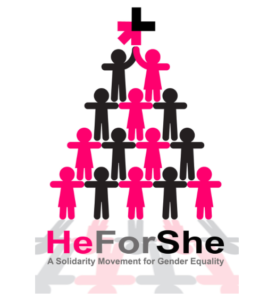 Twenty-first-century Woman is the ground-breaking musical project for International Women’s Day 2019, led by British composer Joanna Forbes L’Estrange who wrote the song. There’s something unique about the sound of a boy’s unbroken, treble singing voice. Theirs has been the soaring top line in cathedrals the length and breadth of the UK since the middle ages and long may it continue for another millennium and beyond. 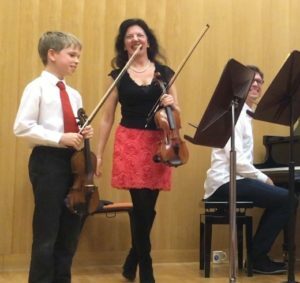 Nowadays a boy chorister not only has the joyous and incomparable experience of being trained to sing from as young as 7 within the context of a professional choir, but the scholarships offered by many choir schools also enable him to have a world-class education at a fraction of the price. I know this because my sons are currently benefiting from this system (St John’s College, Cambridge) as did my brother (Guildford Cathedral), my husband and my brother-in-law (New College, Oxford) and, last time I counted, at least 90% of my male singing colleagues. My nephews (St Albans Abbey and Peterborough Cathedral) and my father and uncle (Hampstead Parish Church) also had the experience of being choristers; my father says that he learnt all he knows about music – this is a lot – from Martindale Sidwell, the then director of music at Hampstead. My years as a chorister at New College, Oxford, have informed everything I have done since, both musically and otherwise. If only their voices had the same unique beauty, I’m certain that girls would have been given the same opportunities for the past 1,000 years. And if women had only been clever enough they’d have been doing all of the jobs which men have been doing for centuries too. Hm. The fact of the matter is rather that boys’ choirs were borne out of the male-only monastic establishments of the medieval age where boys were given music lessons and also a rudimentary education by the choir master and, once their voices had broken, they became the singing men of the next generation (not to mention the priests, lay vicars etc) and so and so on. Since girls weren’t allowed anywhere near those medieval monasteries, they weren’t on the scene when choir schools were founded and choral scholarships established and, consequently, were forgotten about. Nobody thought to question this until, in 1966, on the morning of a planned BBC broadcast of evensong from St Davids Cathedral in Wales, the organist suddenly found that he had no choristers – they were all off sick. So he brought in the all-girls choir of a neighbouring grammar school to save the day and, shock horror, they were pretty good! Three months later, the cathedral formally admitted girls to the choir and set the ball rolling. St Mary’s Cathedral in Scotland followed suit by admitting girls to their choir in 1978. England joined the party when the brand new girls’ choir at Salisbury Cathedral sang its first evensong on October 7th 1991* [see footnote]. I remember it well as I had just arrived for my second year as a music undergraduate at Oxford when news filtered through. I recall having conflicting emotions: while I was delighted for those girl choristers I also felt somewhat cheated out of an experience for which I’d have given anything as a child. When I’d asked if I could be a chorister I’d received the response “girls can’t be choristers.” Until the age of 18, my sole experience of choral singing had been in my little village church choir where my younger sister and I helped to bring down the average age by several decades. My foster father, Richard, loves to tell the story of how I had recently declared myself “too old for Sunday school” – I was 7 – and so he thought I could join the choir instead. I am eternally grateful to him for this decision; cathedral-standard we certainly were not, but there I learnt to sing Psalms, hymns and, most crucially of all, to sightread, a skill which got me successfully through an otherwise terrifying audition for Schola Cantorum of Oxford in my first term as a student and set me on course for 25 years (and counting) of singing in professional choirs. Happily, most of the UK’s cathedrals now have girls’ choirs as well as boys’ and some are admitting female altos too. Things are definitely looking up. Not all of the girls’ choirs get to sing an equal number of services a week to the boys’ choirs but at least girls now do have the opportunity to have the chorister experience. 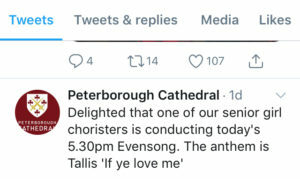 Peterborough Cathedral this week tweeted that one of their girl choristers was going to be conducting an anthem during evensong; what an absolutely brilliant experience for her. Who knows? That may well be a defining moment in her career as a choral conductor. Within the Oxbridge collegiate and choir school system the wheels of change turn more slowly but they are turning: ten years ago St Catharine’s College in Cambridge blazed the trail for collegiate girls’ choirs and, in September 2018, Pembroke College in Cambridge launched its girls’ choir, directed by the brilliant Anna Lapwood. As an organist, she is also an important role model for any girls who may still be wondering if “girls can’t be organists”. Oxford has been slower to catch up but, in 2014, a group of forward-thinking parents helped to set up Frideswide Voices which gives girls the opportunity to sing evensongs in Oxford college chapels and, two years later, Merton College set up its girls’ choir. This is all well and good but anyone in the UK choral scene knows full well the boys’ choirs continue to dominate. Since 1928, when ‘Carols from King’s’ was first broadcast, it has been a mainstay of Christmas and now millions are able to listen to it across the world. For girl choristers, there are still no scholarships or other financial incentives towards their education which are equivalent to those offered to boys. The good news is that people have started to notice the inequality; the bad news is that polemical articles, designed to sell newspapers rather than to effect change, do more damage than good because they risk alienating or even vilifying the very people we need to get on side. As someone who spends a lot of time in Cambridge, attending evensongs at St John’s, conducting my all-female a cappella group Aquila and coaching the choir of Trinity College in their jazz repertoire, I can confirm that there is genuine fear that introducing girl choral scholarships will somehow dilute or spoil the boys’ experience or, even worse, kill it off completely. Don’t forget that in state primary schools it’s near on impossible to get boys to sing at all, hence the need for the brilliant initiative Sing Up , and so we must tread carefully (and get our facts straight). What we need, if girls in Oxford and Cambridge are ever going to be offered a chorister experience which is on a par with that afforded to boys, is a level-headed, well thought through, properly organised and brilliantly executed plan. Plans are afoot and nobody need worry. The future is bright. Watch this space. * It has been pointed out to me since the publication of this article that there were other girls’ choirs in England before 1991, including at Leicester Cathedral in 1978. However, Salisbury Cathedral was, I believe, the first to form a separate girls’ foundation. Thank you for your comments. I welcome any comments which are helpful to the discussion from people who understand the complexity of this matter better than I do. The more informed we are, the better chance we stand of finding a solution which is good for boys and girls. Thank you. • King’s College Service (RSCM) world premiere is on 4 March 2019 at King’s College, Cambridge, as part of their celebration of women composers for International Women’s Day. 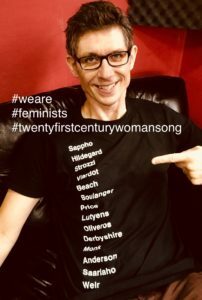 • Twenty-first-century Woman is available to download from all music platforms on 8 March 2019, International Women’s Day, raising money for girls’ education globally. • A place for us maids world premiere is on 28 April 2019 at Trinity College, Cambridge, celebrating 40 years of women being admitted as undergraduates at Trinity. In my 22 years of being a London-based freelance musician, I have worked with singers (men and women), orchestral musicians (men and women), jazz instrumentalists (all male), organists (male with one or two exceptions), conductors (all male apart from one concert in which I was conducted by the wonderful Marin Alsop) and composers (all male apart from the BAFTA-winning Jessica Curry.) I’ve been wondering about the gender disparity; if, a fifth of the way into the twenty-first century, there is such an uneven ratio of men to women in my profession alone, what is it like in other professions? There’s an excellent video on YouTube called Inspiring The Future: Redraw The Balance in which a primary school teacher asks her pupils (girls and boys) to draw a firefighter, a surgeon and a fighter pilot. They set about drawing their pictures, colouring them in, giving them characteristics, names and so on. Without exception, every child draws only men. When they’ve completed the task, their teacher asks “would you like to meet these people?” and, following a resounding “yes!”, into the classroom walk a firefighter, a surgeon and a fighter pilot. As they remove their helmets/masks the cameras close in on the children gasping, mouths gaped, eyes wide in astonishment as they come face to face with three women. It’s a brilliant way to show that education about equality must begin at primary school level (ideally before that) before the gender stereotypes set in. In order for girls to grow up believing that they can be whomever they want to be, they need female rôle models; however, in order for there to be rôle models, there need to be women represented fairly in all professions, especially those which are traditionally solely male or male-dominated, but how can that ever be if those women in turn didn’t have rôle models when they were growing up? We need to be educating our girls (and our boys) to know that being female should no longer prevent anyone from following their dreams. In our modern age where gender fluidity is slowly replacing the old binary perception, hopefully one day it won’t even cross our minds to discriminate according to gender. You want to be an astronaut? Here’s what you need to do. You want to start your own company? Show me your business plan. It’s the polar opposite of what I was told as a child, growing up in the 1970s, but at least I was able to go to school. There are still some countries in the world where girls don’t even have access to education. 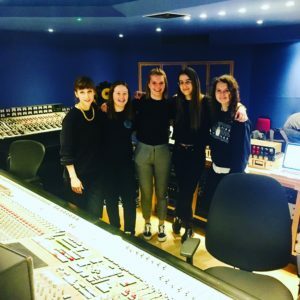 and we made history by being the first ever all-female recording session at Abbey Road. During that amazing day, I asked one of the assistant sound engineers, in her final year studying on the UK’s prestigious sound engineering degree course, the Tonmeister at Surrey University, what the average male/female ratio is on that course – she replied “This year, out of 24 people, there are 4 women” which the others agreed was actually better than in previous years. During the same discussion, it was pointed out that until recording artists and their management start specifically requesting female sound engineers and producers, studios won’t necessarily think to hire any. It’s an interesting thesis. I felt pleased that our engineering/production team members are now able to write on their CVs that they’ve recorded a track at the famous Abbey Road Studios. 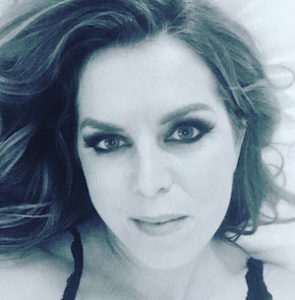 Like the primary school pupils in the YouTube video, I wanted to meet the firefighter, the surgeon and all of the other inspirational women I’d written into the chorus of my song. Since recording the single, I’ve been busy tracking down and filming women from all walks of life to appear in the Twenty-first-century Woman music video. It’s been a fascinating and somewhat humbling experience. 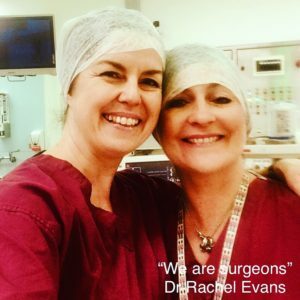 Dr Rachel Evans, a colorectal surgeon at London’s University College Hospital, agreed to appear for “we are surgeons”. Having donned my raspberry scrubs [see pic], I was shown around the operating theatres and had the chance to ask Rachel what it was like being a female surgeon. Looking me straight in the eye she replied “you need titanium balls!” She told me that, in her experience, women in the medical profession tend to choose nursing or anaesthesiology over being a doctor or a surgeon. Interestingly, when I filmed Azra Jivraj for “we’re opticians” she said that her profession had a higher proportion of women than men. our language habits need to change too. 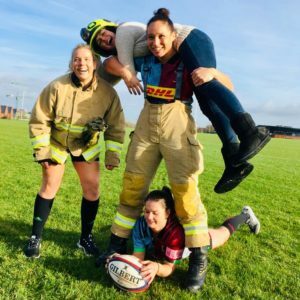 This month, due to new ruling, Shaunagh and her rugby colleagues have finally been able to fulfil their dreams by becoming full-time rugby players and I couldn’t be happier for them. Some of the people I’ve met have been the first women in the UK to hold a particular position. In 2007, after 22 years in the British army, Moira Cameron became the first female Yeoman warder (AKA Beefeater) at the Tower of London. Sadly, she wasn’t permitted to wear her fabulous uniform when I filmed her for the music video so I urge you to google her – it’s awesome! Reverend Lucy Winkett was the first female priest to join the clergy of St Paul’s cathedral. Also a professional singer, she was happy to sing (rather than speak or mime) her line “we are preachers”. 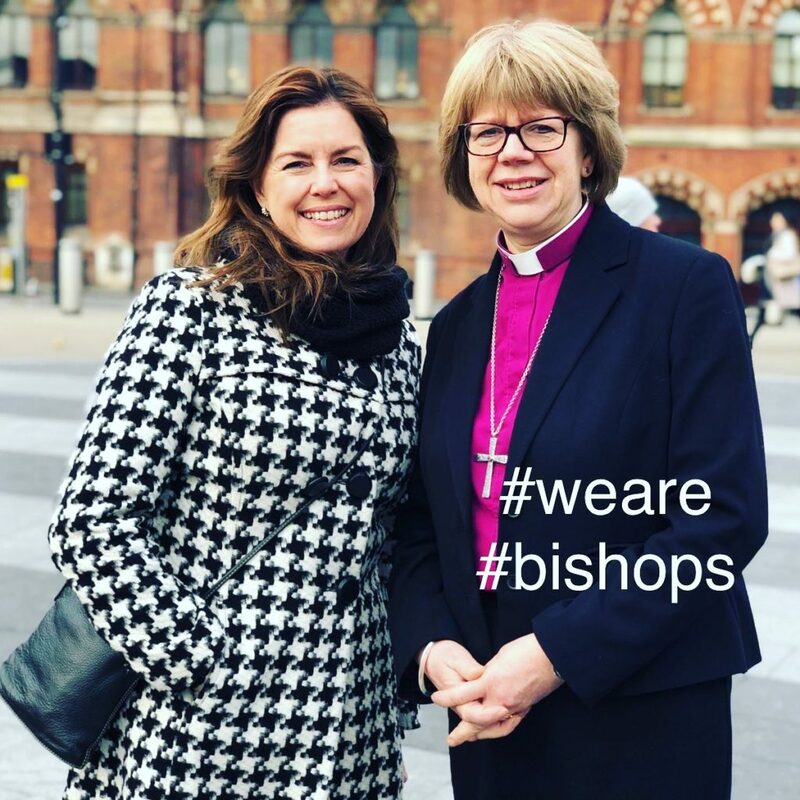 In May last year, the Right Reverend Dame Sarah Mullally was installed as the first female Bishop of London. We met on a cold weekday morning in January amidst the busy London rush-hour as she was on her way to work. In the same section of the song, we also have the inimitable Sister Cristina Scuccia winner of The Voice of Italy in 2014 singing “we are nuns”. She lives in Italy so I didn’t get to meet her in person but her video clip is a moment worth waiting for! I admit to having been ever-so-slightly intimidated by the prospect of meeting so many illustrious women with OBEs, CBEs, MBEs and DBEs after their names but they were all utterly delightful and very personable. Even the unsuspecting Joanna Lumley and Prue Leith, whom I accosted out of the blue at a Christmas party, willingly allowed me to film them for the video. Thank you, ladies. I am in awe of you all. Help us to raise awareness of this project by joining the #weare campaign on social media by posting a picture of yourself with the hashtags #weare # ??? #twentyfirstcenturywomansong Keep it positive! Twenty-first-century Woman will be released on all music platforms on International Women’s Day (March 8th). All money from downloads goes to charities supporting girls’ education globally. On a freezing cold January morning, two friends stood by the Pret kiosk outside King’s Cross station, wrapped up against the cold, waiting to meet a Very Important Person. They’d been told that she’d be wearing a black suit under a dark grey coat and that they should meet her at 8.30am on her way to work. It was all very James Bond (only without the Russian accents). The women had arrived early, just to be sure, and skulked around, excited in anticipation. As the appointed time drew near, they started looking among the morning commuters for the Very Important Person, in case she too had arrived early. Suddenly one of the women grabbed the other’s arm. “There she is”, she whispered, pointing to a woman who’d just joined the coffee queue. “Are you sure it’s her?” the other whispered back. “No, but it looks like her and she’s wearing a black suit…and she’s got the right glasses”, the first woman replied. “You wait here, I’ll go and introduce myself”. “Excuse me, but are you the Bishop of London?”, said the woman with a confident smile.